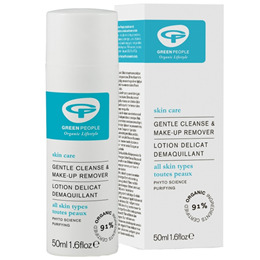 Green People Gentle Cleanse is a 2 in 1 organic cleanser, make-up remover and face wash for all skin types. Containing Chamomile, Marshmallow & Aloe Vera. Want to liberate your skin from pollutants and impurities? Purify with beautiful Gentle Cleanse. This natural skin care product is made without Parabens, Lanolin, ethyl alcohol, artificial perfumes, petrochemicals, phthalates and colourants to bring you the purest cleanser that nature can offer. Aqua (Spring Water), Olea Europaea (Olive) Fruit Oil*, Helianthus Annuus (Sunflower) Seed Oil*, Butyrospermum Parkii (Shea) Butter*^, Glycerin* (Vegetable Derived), Squalane (From Olive Oil), Cetyl Alcohol, Cetearyl Glucoside, Cetearyl Alcohol, Elaeis Guineensis Oil*^, Glyceryl Stearate, Aloe Barbadensis (Aloe Vera) Leaf Juice Powder*, Simmondsia Chinensis Seed Oil*, Rosmarinus Officinalis (Rosemary) Leaf Extract*, Calendula Officinalis Flower Extract*, Aroma [Pelargonium Graveolens Oil*^], Hydrolysed Jojoba Esters, Sodium Stearoyl Glutamate, Citric Acid, Benzyl Alcohol, Salicylic Acid, Sorbic Acid, Geraniol*, Citronellol*, Linalool*, Citral*, Limonene*. *91.6% Organic,^ Fairly Traded. Using fingertips apply in small circular movements to face and neck. Remove with cotton wool or wash off with warm water and follow with a splash of cold to stimulate circulation. For tip-top results finish off with Green People `Gentle Tone`, then moisturise with `Day Solution` or `Vita Min Fix`™. Below are reviews of Green People Gentle Cleanse - Facial Cleanser - 50ml by bodykind customers. If you have tried this product we'd love to hear what you think so please leave a review. Green People Gentle Cleanse is a 2 in 1 organic cleanser, make-up remover and face wash for all skin types. Contains Chamomile, Marshmallow & Aloe Vera.